Turn to the team at FAIRBANKS PAVING CO. in Oroville, California, for sealcoating services. This protective coating ensures your investment lasts longer and is a highly recommended part of pavement and asphalt maintenance. Your sealcoating service can be included in your original paving service, or provided separately to protect a previous installation or to maintain your existing installation. Sealcoating is applied to driveways and roads as they get older to help them last longer and to prevent wear from the elements. Sealcoating is recommended every four to seven years, depending on the weather, sunlight, and wear and tear from traffic. 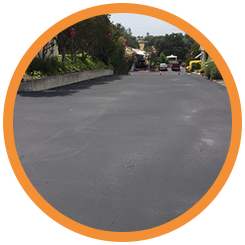 The sealant used revives asphalt and protects it from elements and general wear and tear. Sealcoating costs just a fraction of a new installation. Both residential and commercial clients come to us for sealcoating to protect the investment in their driveways, paths, private roads, and parking lots. We start by cleaning the area to be sealed, including filling cracks with a material suited to the particular crack. Once the area is clean, our black sealcoating is applied and helps your installation look newer and last longer. Our team never cuts corners and always provides a full, professional quality installation for all of our paving and maintenance services. If you want the job done right, give us a call today.